Ever since the opening of the original Polpo, Russell Norman's empire has grown rapidly, one establishment at a time. Each iteration, expanding on the last, all subtly different, but at the heart of it, serving simple straightforward Italian dishes to the good people of Soho. I never had that much love for Polpetto (which seems to be a lot of peoples favourite), with Polpo remaining a firm favourite for a fun and enjoyable meal in Soho, and Spuntino beating them both for fun and food, serving slightly more American orientated dishes. Which brings me to Da Polpo. Focusing it's menu on more casual food like pizzettas and meatballs, I guess you could say that this fits slap bang between Polpo and Spuntino, but with a much bigger space (split over two floors), you are much more likely to land a seat immediately. Located in the heart of Covent Garden, sitting directly opposite London's oldest restaurant in Rules, it is a good fit in a bustling and tourist friendly area, with plenty of demand from tourists and locals alike. It also has the added bonus of being rather close to my office so has been a reliable destination for a quick dinner or something a little more alcoholic involving the slew of Aperol stashed behind the bar. Much like the other "Norman" restaurants, you're working with small plates so are focused on sharing. Bring a group of 5 or 6 and you can aim to try almost a bit of everything. 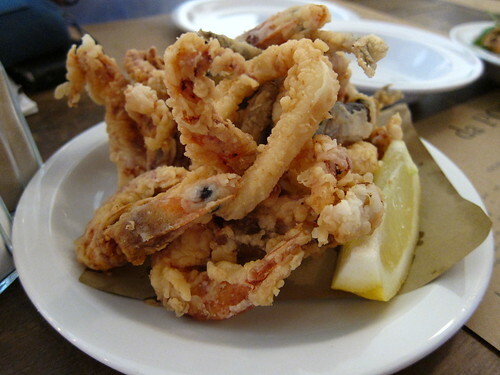 Amongst the small plates I have had, I've enjoyed the light and relatively greaseless fritto misto, with generous portions of squid and prawns, and a simple but excellently executed buttered eggs, asparagus and parmesan dish. And definitely don't forget the array of cichetti, order a few arancini and crochetta to keep the hunger at bay. For me, the pizzettas are clearly the highlight. Although the menu changes quite regularly, you will always be faced with about 6 or 7 of these "mini pizzas". Each cooked perfectly to a slight crisp base and slathered with that thin film of cheese, not haute cuisine, but exceptionally tsty comfort food. Of all the variations I have tried, two stand out. The zucchini, chilli and mint is an unexpectedly flavourful and light combination, and considering the glaring ommission of meat, is an unexpected "must have" from me. If a veggie pizza isn't your thing, the pickled pepper and pork shoulder pizzetta is not only a mouthful to say, but a blissful mouthful of porky flavours mingling with the subtle heat of the peppers. When it comes to the meatballs section of the menu, you will find a rather large selection of meatb based goodness. Once you have chosen your type, then you now need to decide whether to have it straight up, in a piadina "smash" or served with spaghetti. For me, you will always have the traditional pork and beef meatballs in the spaghetti, and either the lamb or pork and fennel in the smash. 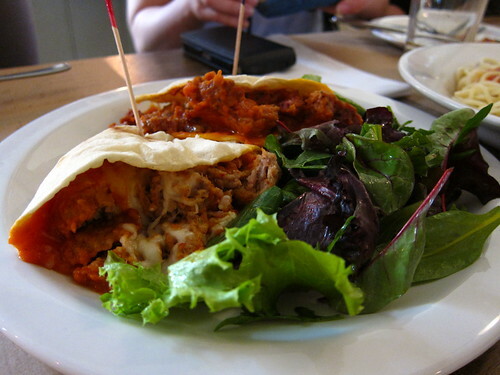 For those who are unaware of what a piadina smash is, it is essentially a flatbread, filled with meatball, cheese and sauce, and given a good squeeze to squish it down, ready to shove into your hungry face. Desserts are also very good, with a well measured selection. Old favourites such as an affogato or a tiramisu are present, or maybe you feel like something a bit different, like a sweet pizzetta slathered with Nutella perhaps? 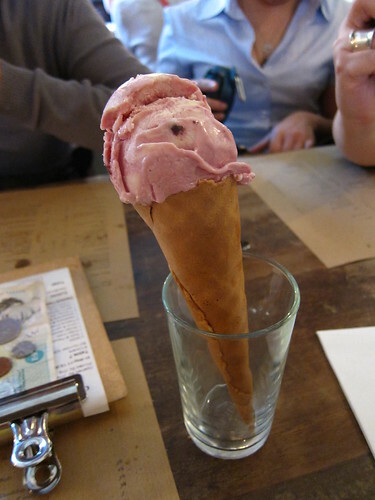 I do love a good gelato, so often opt for the cherry cone. My decision was rewarded by a large helping of excellent gelato scooped into a crisp wafer cone. 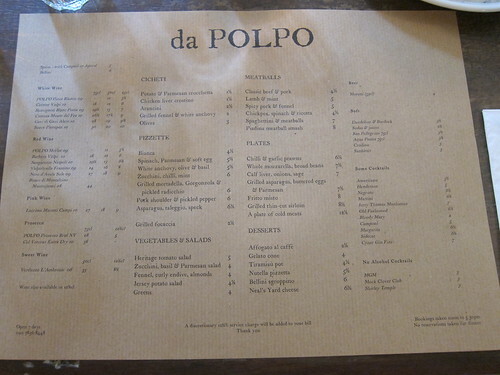 Da Polpo is definitely not a high end establishment, but sits firmly into the middle tier and delivers enjoyable food in a comfortable environment. 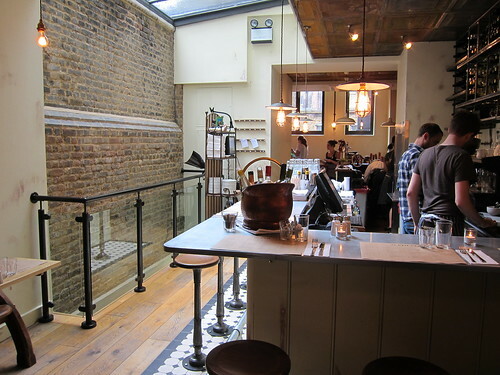 At about £25 a head (with drinks), it is extremely affordable and if you are a fan of any of the other Russell Norman restaurants, I wouldn't overlook Da Polpo, as the menu and room holds enough variety for it to warrant a visit. I am sure that there are more "Polpos" in the pipeline, and I hope that they can maintain enough difference and variety for each one to maintain a clear identity. There was talk of re-enacting the "Norman Conquest", a bar and food crawl of all four of his stable, and if there is any interest at all, I would be more than happy to organise it. This review is spot on - totally agree with all your comments! 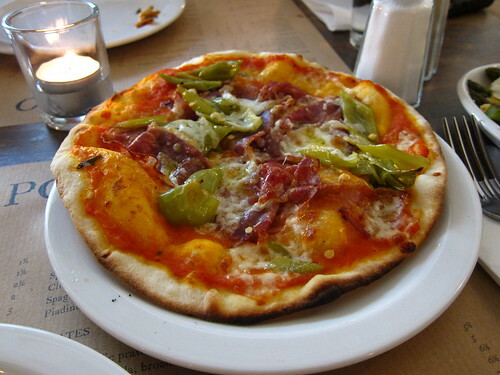 Pork shoulder and pickled pepper pizza was a particular highlight for me too. I thought the sauce on the meatballs had the slight sweetness of heinz tomato soup...but not in an entirely unappealing way! I totally want a meatball smash now. Shouldn't read these things before I've eaten lunch. @Mimi - It needs to be done. @Littleloaf - Thanks, I actually could totally devour a pizzette right now! @G&C - Messy, juicy, meaty. As such a confirmed carnivore, I always feel a little ashamed to admit that, like you, the zucchini, chilli and mint is a mandatory order... it's just so good though!